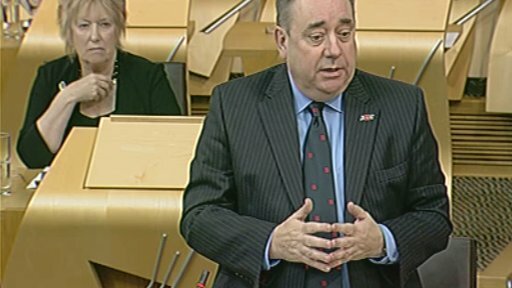 Alex Salmond insisted the NHS was not in crisis and that the Scottish government had maintained funding of health boards in real terms during first minister's questions on 8 November 2012. Mr Salmond was responding to the Scottish Labour leader Johann Lamont who said the Auditor General Caroline Gardner had stated the NHS was on an "amber warning" and was in "crisis". Ms Lamont accused the first minister of "breathtaking complacency" for ignoring serious warnings from the auditor general on the NHS and college budgets. Mr Salmond hit back saying the auditor general had never said the NHS was in crisis. He acknowledged "the very substantial pressure" on the NHS but again reiterated the maintenance of its budget in real terms. The first minister said Labour's plans to "cut vital services to pensioners and students" while backing Scotland's contribution of £163m to the maintenance and refurbishment of Trident would mean the party would "never be reelected". Audit Scotland and the auditor general again provided the issue Scottish Conservative leader Ruth Davidson raised with the first minister, this time on reoffending. Ms Davidson said Audit Scotland had said the Scottish government's spending programmes on refoffending were not known to work and she asked when the first minister was going to get serious about reoffending. Mr Salmond pointed out there were substantial signs of progress on reoffending and highlighted the falling rates of recorded crime in Scotland as evidence of this. Willie Rennie, the Scottish Liberal Democrat leader, said it was wrong pharmacists were being condemned as "methadone barons" and should not be attacked for carrying out the government's drugs strategy. The first minister responded by stressing it was "hugely important " to maintain cross party consensus on drugs policy and for the parliament to unite around a strategy that could "help and assist the people we are here to serve."